Texas Recording Artist Courtenay Royal Releases New Music Project "Late Nights Early Mornings"
Coast 2 Coast Mixtapes announces the release of the new Mixtape "Late Nights Early Mornings" by Courtenay Royal; Courtenay is currently seeking blog placements and interviews. 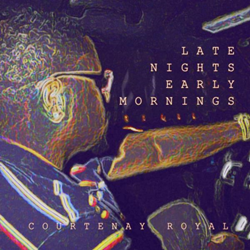 Coast 2 Coast Mixtapes announces the release of the "Late Nights Early Mornings" Mixtape by Courtenay Royal. The Mixtape is currently available to stream and download on the Coast 2 Coast Mixtapes website. "Late Nights Early Mornings" has its own organic original sound, with a message. The birth of Courtenay Royal as an artist began as an inspiring tale of struggle and dedication, climbing through obstacles of the oppositions of life and even death. Courtenay is driving himself and his family to the brink of success using only his intangible talent and immovable inspiration to move forward as an artist. A New Orleans native, his natural style and gripping lyrics define his drive, while becoming an instant success is only satisfying his ambitions. Vigorous detail and aggressive approach are the tools sure to drive the young sensation to the top.